Madison, Wisconsin: August 27, 2016 — Johnny's Plant Breeder Janika Eckert was awarded the All-America Selections (AAS) Breeder's Cup at the annual summit held in Madison. Eckert has produced four AAS-winning varieties: 'Diva' spineless sweet cucumber, in 2002; 'Carmen,' an early sweet red Italian pepper, in 2006; 'Escamillo,' an early sweet golden Italian pepper, in 2016; and 'Cornito Giallo,' a half-size sweet golden Italian pepper, in 2016. Curious as to why so many award-winning vegetable varieties come from the fields of this small, but thriving seed company in Central, Maine, we were recently given the rare chance to peel the onion, so to speak, on breeding at Johnny's in an interview with Eckert. Let's start with you. What do you think about receiving this award? I am honored to be recognized by AAS and to join a group of breeders for whom I have immense respect. I am humbled as well, as I do not see myself, formally, as a member of what I consider a very special group of breeders. I don't have a degree in plant breeding. For me, it has been a combination of my personality, the things I enjoy doing, and my various life experiences that have all come together to make plant breeding the perfect occupation for me. That, plus studying the science… and learning from other breeders. What does it take, in your opinion, to be a successful plant breeder? One has to be both an artist and a scientist. First of all, you have to dream up something — a new vegetable variety. The fun then starts, in figuring out how to create the variety that you have envisioned — you could think of that part as the science. You also have to have the energy to put tons of work into each breeding project, not knowing whether it will ever come to fruition. Then, once you have something that's at least close to your vision, you have to promote it to others at the company in order to get it into production. After that, it's a matter of seeing what your customers think. Specifically, I have used pedigree breeding in my work with peppers, summer squash, and cucumbers. This form of classical plant breeding involves extensive fieldwork and note-taking. One has to be willing to spend long days walking rows of plants in the field, the patience to look at thousands of similar plants one after the other, the eye to recognize those few that stand out, and the perseverance to keep improving those standouts by what some might consider rather tedious, repetitive work over many years. It isn't rocket science to create or improve a variety, but it does require a dogged pursuit of something one believes is technically possible. 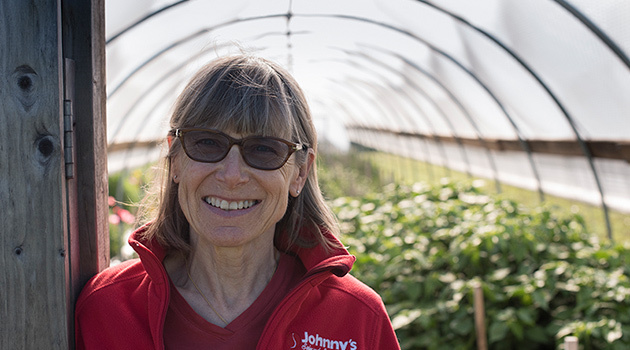 How is it that Johnny's, a comparatively small company, is such a leader in coming up with so many new vegetable varieties for the specialty grower? I think that it has to do with being encouraged to explore the limits and to develop confidence in the products you create. It goes beyond meeting market demand — one has to be bold enough to adventure beyond the known into one's vision of what is possible — to dream up new products and then have the tenacity and know-how to make those products become reality. Working for a company that believes in innovation and continual improvement is necessary. Learning through mentorship has been a key part of my training. I was Rob Johnston's technician for many years, which was both my introduction and the single most important factor in my becoming a successful plant breeder. I have continued to rely on his advice throughout my career. Other important people for me — who have made a difference in my breeding — were Brent Loy, Stephen Baenziger, Ken Owens, Bob Heisey, Michael Mazourek, Michael Dickson, and Irwin Goldman. You mention having a vision — an idea… what was your vision for your two newest varieties, 'Escamillo' and 'Cornito Giallo' peppers, in addition to your other AAS winners, 'Carmen' pepper and 'Diva' cucumber? Taste is the single most important attribute in everything I have bred, indeed, the top criterion for all of our breeding work here at Johnny's. In the case of the three peppers, my goal has been to breed flavorful and attractive peppers in different colors, for eating either fresh or cooked. I also have aimed for peppers that are easy to grow in a wide variety of growing conditions and locations, which mature early, and which have a plant architecture that helps keep the fruits healthy. With 'Diva,' we were aiming for a nonhybrid, Beit-Alpha (Mideastern type that is thin-skinned and sweet) cucumber that was gynoecious (all-female flowers) and parthenocarpic (sets fruit without pollination). I worked closely with Rob Johnston on this project, which started before my employment at Johnny's. Are there any other contributing factors to your success? First and foremost, I have had the privilege and joy to work at something I love doing. Johnny's is an organic farm located in the Northeast, so we have some very strong natural selection pressure, which helps in weeding out weaker varieties. Finally, I have had strong support at Johnny's over the years, which has strengthened my confidence and helped me to believe in my vision. This derives from all of the people I have worked with — especially my technician, Aneta Jacobs, and the many farm workers who have done so much of the heavy-lifting over the years. Clearly, patience pays off, when art and science converge to produce delicious varieties at Johnny's Research Farm. Unlike the products of larger crop breeding companies — designed to meet the rigors of monoculture, packaging restrictions, and long-distance shipping — Johnny's flavorful, widely-adapted varieties are renowned for their ability to withstand diverse environmental pressures, which suits the wide-ranging needs of smaller, fresh-market growers and home gardeners. We look forward to trying whatever Johnny's award-winning plant breeding team dreams up next.